The University of Scranton recognized A.J. Guzzi General Contractors, Inc., as its 2018 Business Partner of the Year. 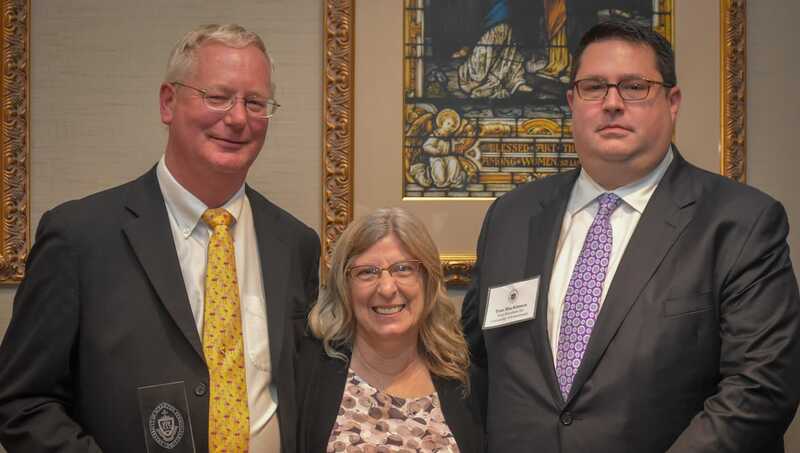 Pictured at the 13th annual Business Partner Appreciation Dinner, from left, are: John and Carol Heim, owners of AJ Guzzi General Contractors, and Thomas MacKinnon, vice president for University advancement. The University of Scranton named A.J. Guzzi General Contractors, Inc., South Abington Township, as its 2018 Business Partner of the Year. The award, presented at the annual Business Partner Appreciation Dinner held recently on campus, recognizes an organization for contributing outstanding service and value to the University’s Jesuit mission. A.J. Guzzi has worked on a number of projects for the University, including multiple phases of the Commons restoration and improvements, renovations to the University’s television studio and, most recently, the Estate landscaping project. Their work on the Commons restoration and Estate landscaping standout as quality exterior masonry work that will last at the University for decades to come. The annual event recognizes the top 100 companies that make outstanding contributions to the University’s ability to deliver a superior educational experience its students. This is the 13th year the University has recognized a Business Partner of the Year.